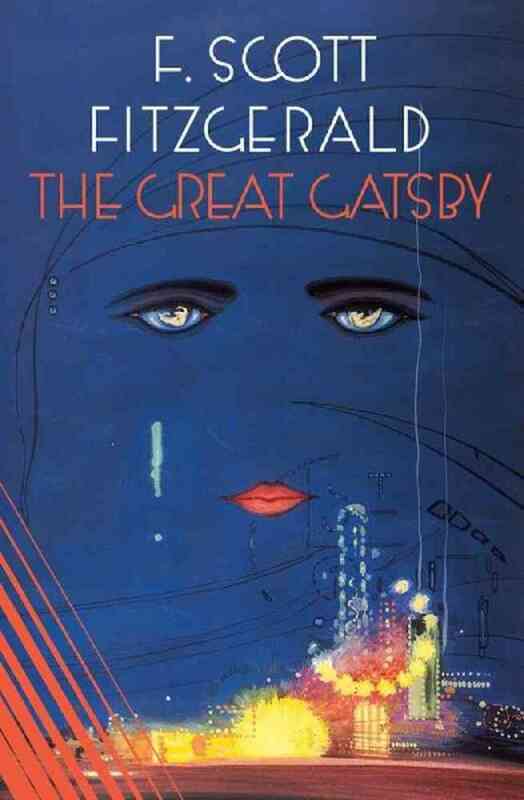 I read a high-school copy of The Great Gatsby by F. Scott Fitzgerald in Monteverde, Costa Rica, at my host family’s house, during a teaching internship. I also read I Know Why The Caged Bird Sings and The Bluest Eye, but The Great Gatsby was the most incongruous story in a place where the houses are made directly out of the trees that were cut down to carve a little space out of the Cloud Forest. I also remembered a tense, emotional scene in a hot hotel room. And I remember that Jay Gatsby is a mysterious man in love. That’s about it. So really, when Skye and I went to see Baz Luhrmann’s film adaptation, nothing about it was spoiled for me. From what I can tell via Wikipedia (since my memory does not serve), the film’s plot is very loyal to the book overall, and there’s tons of action in it that I did not see coming. Win! Seriously, what an amazing cast. 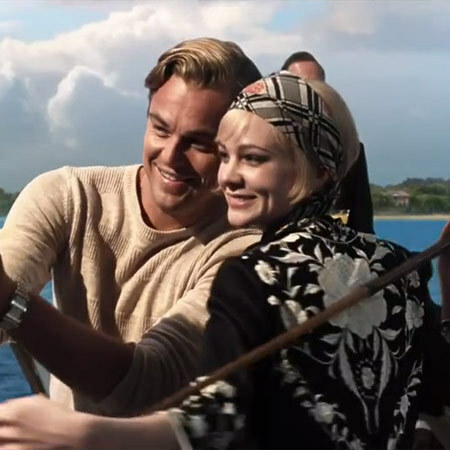 Leonardo DiCaprio as Jay Gatsby, Tobey Maguire as Nick Carraway, Carey Mulligan as Daisy Buchanan, Isla Fisher as Myrtle Wilson… all brought their characters to life memorably (unlike the book, apparently, for this lazy reader). Joel Edgerton (Tom Buchanan) and Elizabeth Debicki (Jordan Baker) were quite believable as well, IMO. If you’ve seen Baz Luhrmann’s “Romeo + Juliet” or “Moulin Rouge”, you could immediately guess that this film was also by him. It has all the earmarks: the era-conscious style from the very credits; the deliberate juxtaposition of loyal period costuming and anachronistic music; the crowd/party sequences that make you feel like you’re on drugs. And he likes him some Art Deco. We saw the 3D version, not because we’re particular fans of 3D but because the showtime worked best for us. As I saw it, the 3D stuff is kinda contrived. The plot doesn’t exactly lend itself to OMGitscomingrightatme!! Nevertheless – the stuff they did was pretty cool. I found the 3D effective in illustrating connectedness, underscoring distances of space and time, making snowflakes look cool, and rendering those surreal scenes even more trippy. In the movie, the effect of that billboard with the disembodied eyes is downright eerie, and is probably branded on my memory forever. Well played, Baz. I enjoyed the party scenes and the sweeping 3D vistas and so on, but I enjoyed even more the focused scenes with the hard-core dialogue and acting. Those were SOLID. And now that I think about it, Luhrmann is just as good at taking things down to their essential heart as he is at making a big fancy imagery-fest. And I guess Fitzgerald was also good at getting to the heart of things. The Great Gatsby was a commentary on excess and corruption and certain flaws in the American Dream, but it also is about people. What kind of attitude matters, what makes a person good or bad. It’s an interesting perspective that definitely provoked me some thoughts. We went to see this movie – at 4 pm on the day it opened, no less – because it stars Skye’s boyfriend, Leo. Kudos, Skye, I have to admit he’s looking mighty fine these days. Skye and I gave this movie four out of four thumbs up. So. We went to see this movie at the UltraAVX (“Ultra Audio-Visual Experience!! !”) theatre, which has assigned seating. We got to pick our seats when we purchased them, and there were like six other seats booked in the whole place, so naturally we picked far away from anyone else. Upon arriving at our seats, we saw that there was an elderly couple in our seats. They had chosen not to sit in the seats they’d picked originally, because those were too close to another couple of people who were, in the words of the curmudgeon gentleman, “just yappin’.” He recommended we not sit near them (even though they were more than entitled to yap – the previews hadn’t even started). If you decide to move from your assigned spot in a theatre where there are approximately twelve-and-a-half zillion empty seats, proper etiquette does not allow for you to sit one seat away from the people whose seats you accidentally took, then complain about the noise level of some innocent moviegoers… and then proceed to SNORE THROUGH THE LATTER HALF OF THE MOVIE. No. Ce n’est pas acceptable. Just so you know. I’m excited to see this movie. 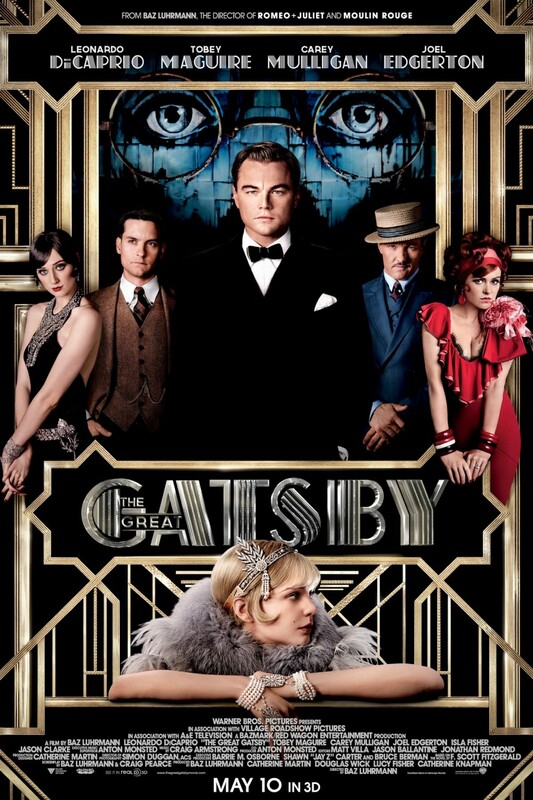 The Great Gatsby is one of my fave classics. I’ve been wanting to throw a Great Gatsby theme party for years now. You’re invited!